Tender, juicy and flavorful are just a few of the words used to describe our Organic Beef Chuck Roast. Made from the beef chuck roll, when slow roasted with water, vegetables and seasoning you'll have a delicious, easy to prepare dinner that the whole family will enjoy. This is a variable weight product that will range from 1.5-2.5 pounds. If you have questions about this product, please call 877.662.6328. Limited supply, order now! 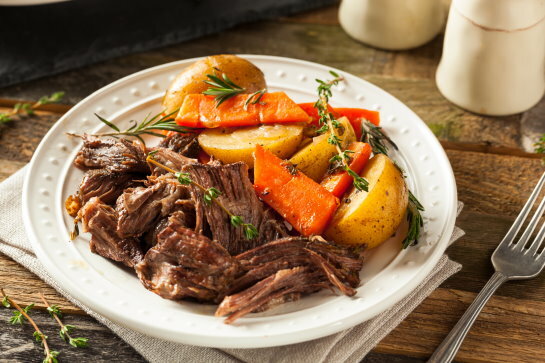 Cooking: We recommend long, slow, wet cooking methods for tender, flavorful Organic Chuck Roll Roast, such as a crockpot or roasting in a Dutch oven. 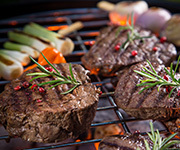 Cook to 145 °F as measured with a food thermometer placed in the thickest part of the meat. 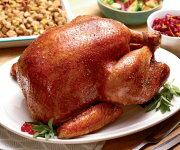 Remove from heat and allow meat to rest for three minutes before carving or consuming. 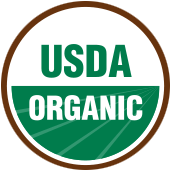 Handling: Organic Prairie meats are vacuum sealed in air-tight packages and frozen to preserve optimum taste, flavor and freshness. 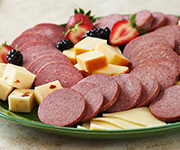 Store in your freezer and thaw meat in the refrigerator or by microwave before cooking. Made from the beef chuck roll, when slow roasted with water, vegetables and seasoning you'll have a delicious, easy to prepare dinner that the whole family will enjoy. This is a variable weight product that will range from 1.5-2.5 pounds. I slowly simmered my chuck roast after a quick searing. The beef roast turned out tender and had plenty of flavor. I added a few yellow onions, Celtic sea salt and coarsely ground pepper. Yum! What better review can I give than to say I will order again before I run out. This cut lends itself to so many different preparations and flavors! Thanks Organic Prairie! I am so grateful to be able to have a place that I can go to purchase healthy meat! It is so good, and I don't worry about any future health problems when eating this meat, from antibiotics, hormones, and GMO feed! 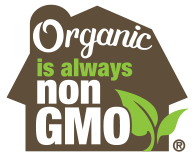 Thank you Organic Prairie for caring about people first. SSSSSSSSSSSSSoooooooooo delicious and tender and yummy. Best chuck roast have found in decades. Bought four and will be buying four again soon. 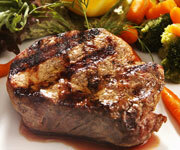 The beef has a rich flavor that is so yummy! This chuck roast was great! Every one I have ordered has been superb! 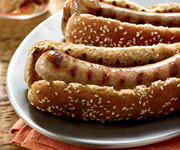 Tender, Flavorful and makes a great healthful meal! These roasts had great flavor and tenderness. They were a bit fattier than previous roasts ordered. This is a beautiful chuck roast. My favorite thing is throw it in the slow cooker with a jar of sliced pepperoncini (with brine), a few cloves of garlic minced and a packet of Simply Organic Italian dressing seasoning. 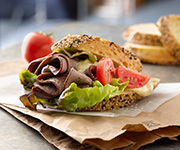 Shred and serve on toasted hoagie rolls with Provolone. I could just about eat that every day. CERTAINLY NOT THE SAME QUALITY I USED TO ORDER. i ORDERED BEEF ROAST AND GOT MORE FAT THAN LEAN TOTALLY. HAD TO CUT OFF OVER 50%. MEANS I PAID DOUBLE FOR SOMETHING LESS THAN DESIRABLE. ORDERED 3 ITEMS IN THIS ORDER AND ALL WERE SO DISAPPOINTING THAT I WILL NOT BE COMING BACK TO PLACE ANOTHER ORDER EVER. QUALITY HERE HAS GONE DOWN THE DRAIN. One of the two chuck roasts I bought was literally the worst cut of meat I've ever had. Cooked the same way I always do a roast (in a dutch oven with carrots, celery and onions in the bottom and doused with white wine vinegar and soy sauce at 300 degrees for 2 hours) and came out as tough as leather. The roast actually twisted in two places (like grabbing the ends of a towel and twisting) it was so fibrous. Parts of the two ends were edible, but most of it was not. What was edible was still tough and not very tasty. The only saving grace is that I was not serving this to company. The second roast was clearly a different cut and not like anything I'd ever seen--closer to a sirloin than a chuck roast--flat, 2 inches thick and elliptical. Cooked better and was more tender than the 1st (and tasted like chuck), but was nowhere near what I want from a roast. I'd be tempted to try to cook it longer except that it was already starting to dry out. Fibrous is just the best word I have to describe these. Owner Response: Hi Bill, I am sorry the experience with your last purchase was not up to your standards. A Member of our Consumer Relations team will be reaching out to you shortly on this issue. If you have an immediate question or concern, please contact us at 1-877-662-6328.